This Spongy Quinoa Idli is a delicious fusion and you can enjoy the health benefits of both Urid dal and Quinoa both Protein Rich Foods. A traditional breakfast in South India, Idli is now popular and enjoyed across the length and breadth of the country. Idlis are breakfast and snack and for my husband dinner and for the girls tomorrow’s breakfast. An idli is 3 parts carbohydrate and 1 part protein and is paired with chutney, sambar, and/or other accompaniments. Mixtures of crushed dry spices such as milagai podi, chatni pudi are the preferred condiment for idlis eaten on the go. Ideal breakfast!! 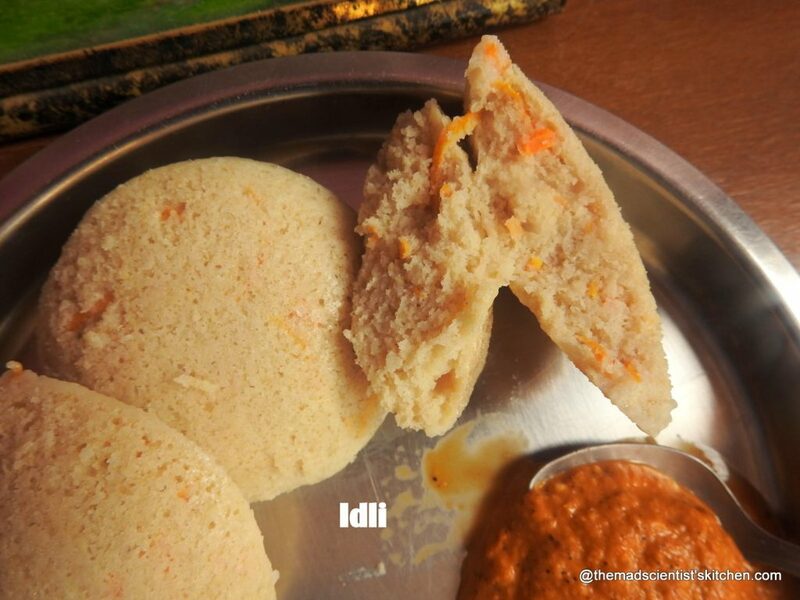 To read more about idli check here. One of the latest entrants in my pantry is Quinoa. Quinoa pronounced as ‘keen-wah’ is tiny bead like grain. Looks quite a bit like tiny jowar seeds (also know sorghum). Quinoa is all protein and contains 8 essential amino acids. If that is not enough quinoa is packed dietary fibre, phosphorus, magnesium and iron. It is also gluten-free and easy to digest. About the health benefits and usage check here. So this you will agree is an ideal candidate for protein healthy food and also as a Simple and Healthy Diet in Old Age. The main ingredients in this Quinoa Idli are quinoa, rice and urid dal. The other idlis in my space are Idli(Steamed Rice Cakes) , Mallige Idlis/ Jasmine Idlis, Khushboo Idli, Jowar Rava Idli~Diabetic Friendly, Idli~~ Old wine in a new bottle!, Hot Cross Idli, Mixed Daal Idli and the most difficult idli of all BUTTER IDLIS. The idli variants appreciated by the girls are Idli Chilli Fry or fried idli. This recipe I have adapted from Padhuskitchen and have loved it. Begin the day with a healthy breakfast of Quinoa Idli ! Rinse and soak the urid dal and the quinoa separately. Add the methi seeds to the urad dal to soak. Soak for a minimum of 5 hours. Soak the idli rava/sooji in a deep vessel. Let it stand for a few minutes. Then decant the liquid. Repeat for 2-3 times. Set aside after the last rinse. Drain the urid dal and reserve the water. Grind the urid dal and methi using the mixer in pulse mode initially till the dal moves smoothly adding water little by little. I must have used about ¼ to ½ cup for the grinding. Then I use the buttons from 1 to 3 to get my smooth paste. Add the urid dal mixture to the Idli rava/sooji vessel. Grind quinoa to a smooth paste add water if needed. Remove the batter into rava/sooji vessel. Mix all the contents well. The consistency of the batter should be like our regular idli batter and should not be too thick or too thin. You can add salt if you wish I add it just before making the idli. Leave the batter to ferment for 6 hours or as in my case overnight. Just before making the idlis I add my salt and mix well. Idlis can be made in a steamer or a pressure cooker and an idli stand mould. In case you are using the pressure cooker remove the weight/whistle. Add water to the base of the steamer or a pressure cooker and bring to boil. Grease the idli plates with a little oil and set aside. Mix the batter well add the grated carrots if using and ladle the batter in the mould. Transfer to the steamer or a pressure cooker and cover. Cook on medium heat for 15-20 minutes. Allow the idlis to cool for 5 minutes and then remove the idlis. Repeat the same for the rest of the batter. Enjoy soft and spongy quinoa idlis with any chutney or sambar. The quinoa is a super Protein and the idli looks nice and spongy . I love the first click and the carrot specks look so pretty . Wow… What a lovely breakfast.. Super pick… I am going to recreate ur version of Quinoa idli soon.. Bookmarking!! Archana, first of all, that platter looks so delicious. Idli with peanut chutney is something that we love. Quinoa idli look so spongy and love the carrot specks. Beautiful! Quinoa is a wonderful ingredient to work with if you love the taste. Those idlis look super soft and fluffy. Do you have the recipe of that groundnut chutney?? The idlis looks so spongy. I have seen so many quinoa recipes but they charge a fortune for a small pack so I haven’t yet tried it yet. Let the prices come down before trying. loved the bits of carrot peeking out ! do these idlis have a soft spongy texture, Arch ? else my kids won’t touch it. The idlis look so soft and spongy. Hard to tell it isn’t the traditional ones. I have been planning to make these. Will try your recipe for sure! 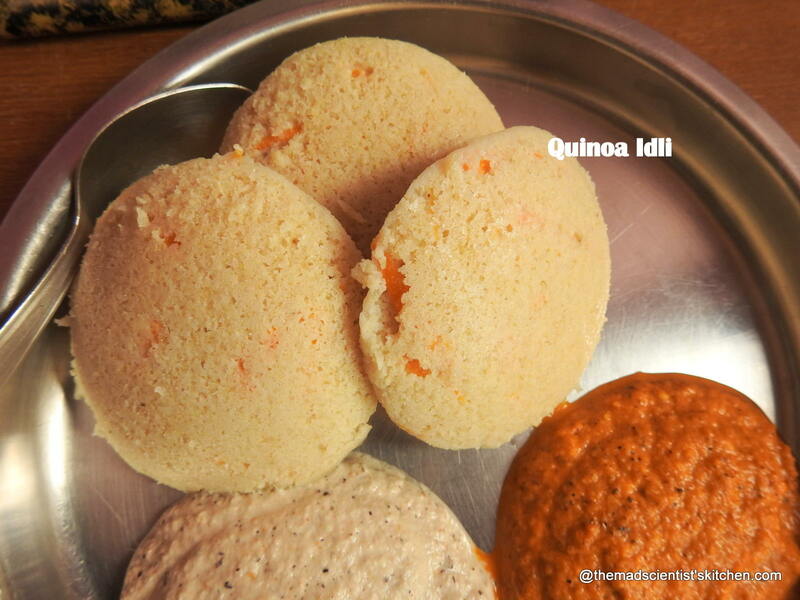 Quinoa idlis is on my ‘to do’ list. The idlis look so soft and super tempting. What a healthy idli…Nothing can beat this breakfast. That’s one healthy idlis you have here Arch, never used Quinoa yet, this surely tempts me to try! How spongy and healthy this quinoa idli looks, feel like having some anytime of the day. love how you have incorporated quinoa into something as traditional as idli. Makes it healthier without compromising on the taste right? The idlys have come out so well and looks so soft and spongy. so from 3:1 carb:protein; you changed it to 1:1.5 carb:protein. And the idlys really look too spongy. Will definitely try. Quinoa is a super grain and a healthy option.. will try the idlis with quinoa soon.. I love idlis. Thanks, please try and let me know how you liked them. 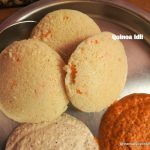 Healthy and delicious treat for breakfast or dinner..The idlis looks soft and fluffy!! Quinoa idli looks so soft and yum and they are protein packed and so so healthy. I am definitely making this. 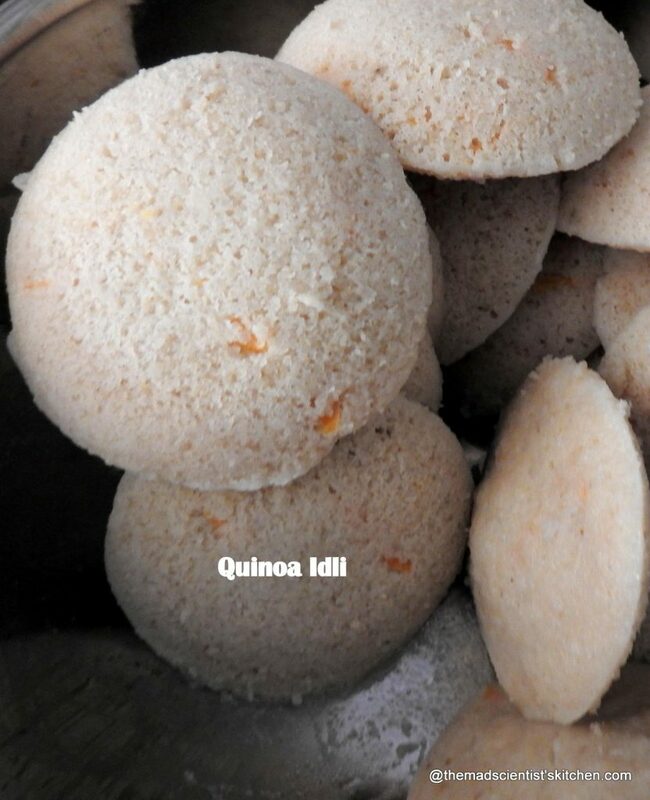 Love these super soft protein rich Quinoa Idlis.This is on my to do list. Fabulous share. 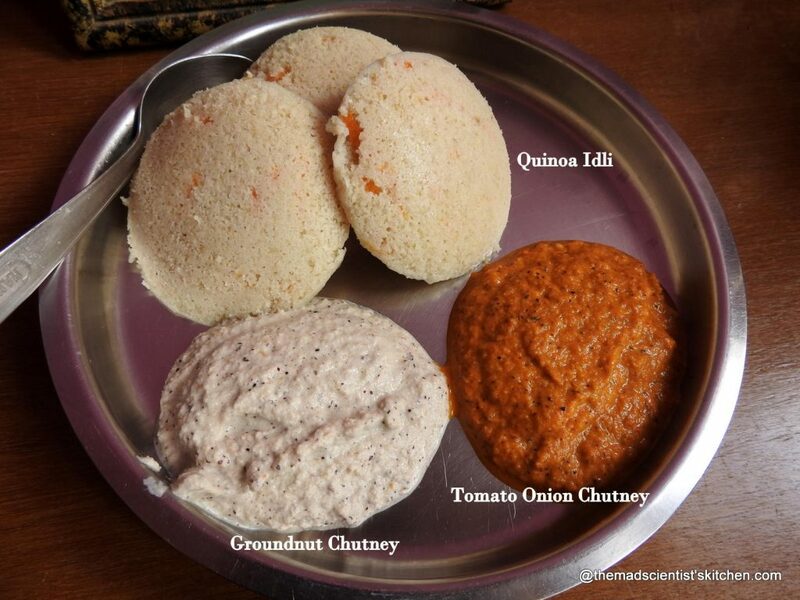 Wow Archana you made these idli super healthy by adding quinoa. Loved the colour of the idli. Never used quinoa before but now planning to buy some. Superb share.